One of the most powerful songs in all of country music history is “Seven Spanish Angels,” made famous as a duet between Ray Charles and Willie Nelson. The song tells the sad tale of an outlaw and his lover who meet a heartbreaking fate after being pursued by a bunch of lawmen. It was a tale that country fans found themselves listening to over and over again, and it topped the charts in both the U.S. and Canada as a result. Over three decades since “Seven Spanish Angels” was released, artists continue to bring its sad story to life. New covers of the song emerge on the daily, with one taking place on the set of the new competition series Real Country. You have the talented vocalist Bri Bagwell to thank for the heavenly rendition of “Seven Spanish Angels” that you’re about to hear. A six-time winner of the Texas Regional Radio Female Vocalist of the Year Award, Bagwell’s talent caught the attention of Real Country panelist Travis Tritt, who invited her to appear on the show. Bagwell came prepared to impress, and did just that with her performance of “Seven Spanish Angels.” Although she was accompanied by some background vocalists, the heavenly sound of her voice stood out among all others. At one point, she hit a note in such a way that left the audience applauding and Tritt hollering in delight. 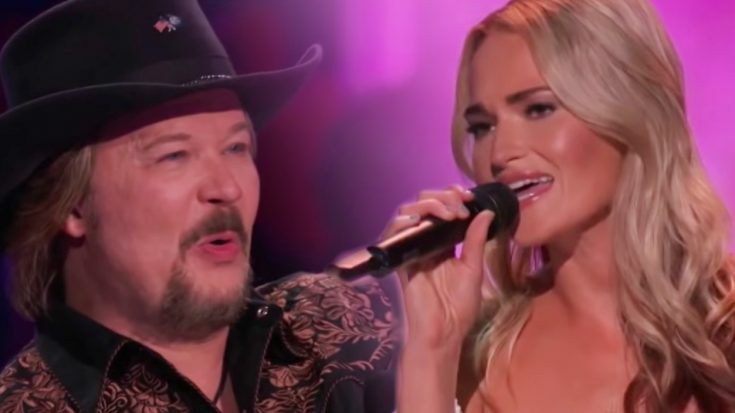 After her performance aired, Bagwell earned an even greater showcase of praise from the man who invited her to sing on Real Country. Taking to Twitter, Tritt had nothing but lovely things to say about her talent as a singer, songwriter, and performer. “I’m telling you folks, @BriBagwell is an absolute REAL COUNTRY STAR!! !” he wrote. “Thanks for being a great man and an idol to so many… and def me!” she wrote. Once you witness Bagwell’s performance of “Seven Spanish Angels” below, you’ll be able to understand why she drew such powerful praise from Tritt. When someone like him compliments a performance in such a way, then you know it has to be good!